Not realising the connection, I started to spray my magnesium oil on, my hands and rubbing it into my knees, and suddenly I was extra special friend Lynny, that needed lots of licks again. Penny dropped… Dogs love the magnesium oil. 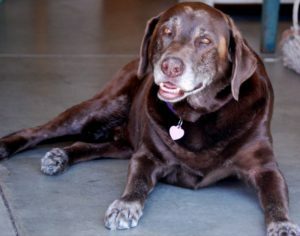 I was just reading that all dogs, especially if their diet is just dried food, canned or dog roll, but generally dogs will LOVE magnesium oil, and in old dogs, Magnesium oil is particularly effective against calcification, joint pain and other spinal problems as well as heart problems. With the old dogs, you should just give them a spray or two on the back of the neck or upper back so it also gets the change to soak in their skin as well. One person commenting on the article also said they sprays oil in their water or on the food. I assume it would be the same for cats, and vets around the world often use magnesium oil to give your pets and extra boost for everything from wound care to general health maintenance.